Three world-class ski areas are within 1.5 hour drive, including Sunday River in Bethel, Maine only 45 minutes away. Smaller ski areas of Black Mountain and Mt. Abram are less than 30 minutes away. Cross country ski and snowmobile enthusiasts can enjoy the many trails, which honeycomb the foothills outside the Farm's front door. A special treat for cross country skiers is Blank Mountain, located just 20 minutes away, where the U.S. Cross Country Ski Team trains. The jewel of the location is Worthley Pond. This sparking clear small lake is perfect for all water recreation. Approximately 5 miles in circumference, Worthley Pond is perfect for sailing, water skiing, fishing and canoeing. Fishing on the Pond is very good with many Trout and Bass taken annually. The Farm At Worthley Pond has a private sand & grass beach access to Worthley Pond with approximately 150 feet of frontage. The Farm provides an eight-person all season outdoor hot tub and a twelve-person indoor sauna. Miles of country blacktop roads out the front door make for perfect biking. The Farm provides bikes ready for use. 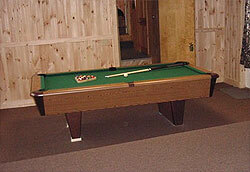 The Farm proves a remodeling billiard and game room. The Farm At Worthley Pond provides two canoes, paddleboat and rowboat at no additional charge. The Farm is located within 35 minutes of four golf courses including the very well known Bethel Inn Country Club.